LINCOLNSHIRE, Ill. and SALT LAKE CITY (May 3, 2016) — A new study from Aon Hewitt and O.C. Tanner reveals many employers are missing the mark when it comes to recognizing and rewarding millennial employees. Aon Hewitt and O.C. Tanner studied more than 470 employers across five countries to examine the strategy, vehicles and effectiveness of their recognition programs. According to the findings, one in four organizations find their current recognition programs are ineffective for millennial workers — the youngest generation in the workforce. A separate Aon Hewitt report shows millennial workers agree that their employer’s recognition programs are unsatisfying. Nearly two in five millennials (38 percent) would like to see the recognition program at their current employer improved. O.C. Tanner, number 61 on the 2015 FORTUNE 100 Best Companies to Work For® list, helps organizations create great work environments by inspiring and appreciating great work. Thousands of clients globally use the company’s cloud-based technology, tools, awards and education services to engage talent, increase performance, drive goals and create experiences that fuel the human spirit. For more information visit octanner.com. 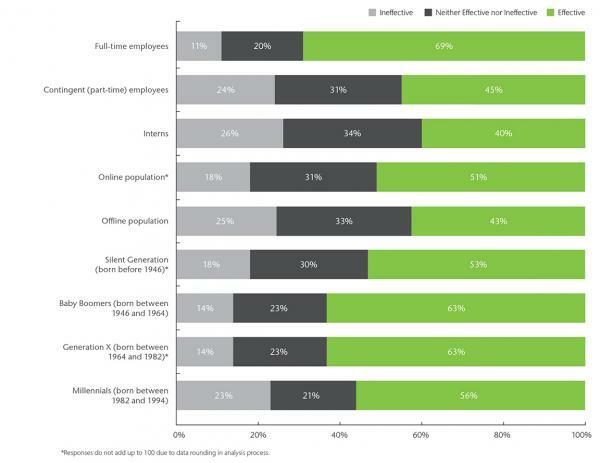 Workforce Mindset Study, Aon Hewitt 2015.